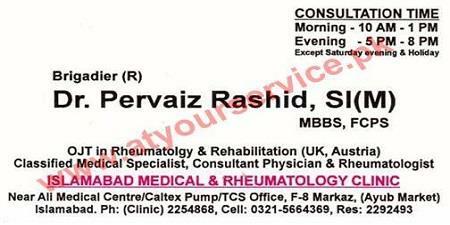 Brigadier (R) Dr. Pervaiz Rashid, SI (M) has done OJT in Rheumatology & Rehabilitation (UK, Austria). He is Classified Medical Specialist, Consultant Physician & Rheumatologist. A rheumatologist is an internist or pediatrician, who received further training in the diagnosis (detection) and treatment of musculoskeletal disease and systemic autoimmune conditions commonly referred to as rheumatic diseases. These diseases can affect the joints, muscles and bones causing pain, swelling, stiffness and deformity.